When we think of civil and human rights, our thoughts often land on the Constitution, the Bill of Rights, and the Declaration of Independence. Those documents that tell us our rights as citizens. The right to "life, liberty and the pursuit of happiness", the right to freedom of speech, to bear arms, to vote, to be free from unlawful search and seizure, the right to a jury of our peers. Each of those documents is important in its own right. Yet for individuals with disabilities, the right to dignity and self-determination can look different. For us, the path to living our lives on our own terms requires more work. We have the Americans with Disabilities Act to ensure access to accommodations so that we can work and enjoy community like those without similar challenges. That said, we often have to self advocate for what we need. We have to be more assertive in order to be heard. Being assertive involves expressing your thoughts, feelings and needs while respecting the person you are talking to. It also means recognizing that other people have the right to express the same. Communicating assertively can help one feel understood, increase confidence, and decrease conflict. The following rights highlight the freedom you have to stand up for yourself and be clear about your position without disrespecting others. 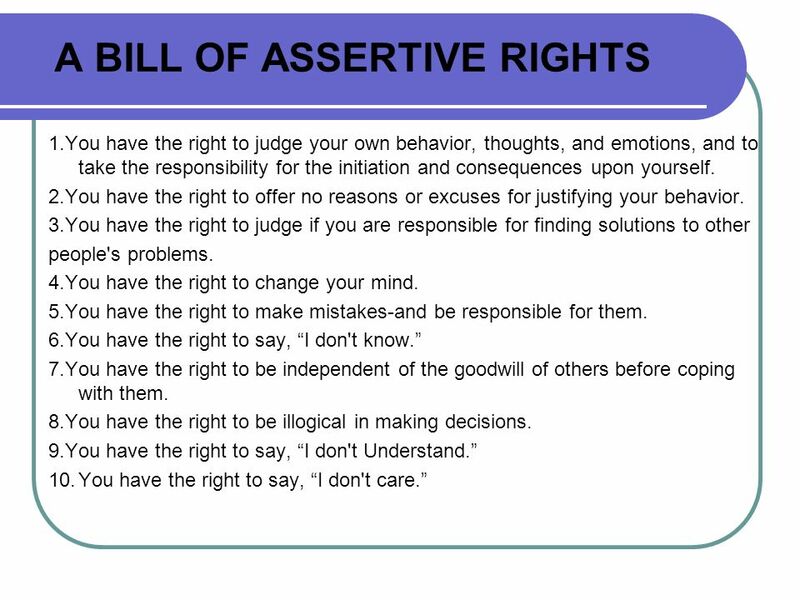 Enter the Bill of Assertive Rights, developed by Manuel J. Smith Ph.D., author of When I Say No, I Feel Guilty: How to Cope - Using the Skills of Systematic Assertive Therapy. This list of rights reminds each of us that we have the right to determine what is best for us on our own terms. When we consistently behave in an assertive manner to advocate for our own freedom to choose, we reinforce our value. Many of the ideas now associated with assertiveness training were first proposed in Smith's book When I Say No, I Feel Guilty, published in 1975. The book explains that assertiveness is largely about expressing oneself clearly and resisting manipulation. It proclaims a ten-point 'Bill of Assertive Rights', all based around one key principle: "The right to be the final judge of yourself is the prime assertive right which allows self-determination". 1. You have the right to judge your own behavior, thoughts, and emotions, and to take the responsibility for their initiation and consequences upon yourself. 2. You have the right to offer no reasons or excuses for justifying your behavior. 3. You have the right to judge if you are responsible for finding solutions to other people's problems. 4. You have the right to change your mind. 5. You have the right to make mistakes - and be responsible for them. 6. You have the right to say, 'I don't know'. 7. You have the right to choose to accept or not accept "help". 8. You have the right to be illogical in making decisions. 9. You have the right to say, 'I don't understand'. 10. You have the right to say, 'I don't care'. Paulissa Kipp, CPSWS is a Certified Peer Support Wellness Specialist, Youth Mental Health First Aid and Wellness Recovery Action Planning Facilitator. An individual with lived experience in maintaining mental health,Ms. Kipp is a Rebel of Intentional Presence using creative expression to promote wellness. She believes that meaning becomes purpose, purpose becomes hope, and Hope Writes Its Own Story.